These 2x3 crimp connectors can be snapped onto 6-wire ribbon cable to make your own cable assemblies and keep your connections organized. These 2x3 crimp connectors can be snapped onto 6-wire ribbon cable to make your own cable assemblies and keep your connections organized. Simply press the connector onto your ribbon cable, no soldering required, which makes it easy to add as many mid-cable connectors as you need. 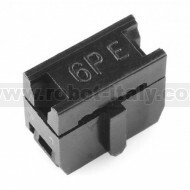 Check the related items below for ribbon cable to go with these connectors. Ribbon cable is really helpful in situations where you need to make a lot of connections without a big mess of wires. Cavo Flat per il connettore del Raspberry Pi. Consente di utilizzare comodamente i GPIO di cui e' provvisto.